"Being a woman in tech, it is not uncommon to be the only female in the room. For me, part of overcoming that challenge lies in mentoring other women through the process." 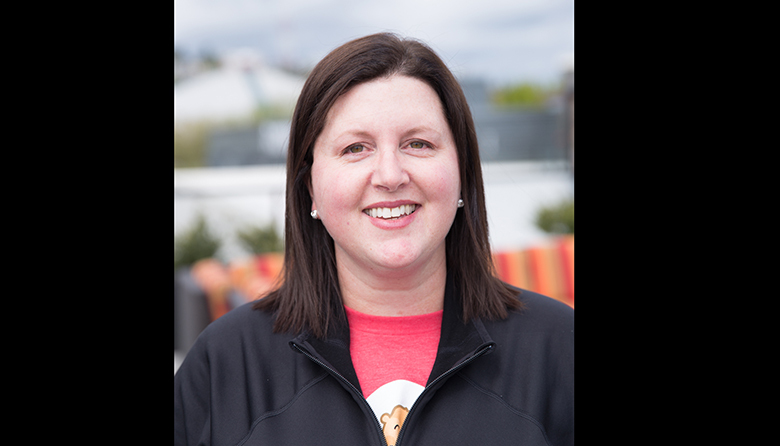 Gwen Murray, Shyft's vice president of marketing, is this week's Daring Woman. Shyft is a Seattle-based, award-winning startup that created an app for scheduling shift-based employees. Read about her proudest moments, challenges she’s faced in her industry and her advice to women starting out in their careers in this week's installment of our Daring Women Q&A series. 1. Tell us about the high point of your career. What do you love about your work? Describe your proudest moment. In terms of my work, I love getting to put Shyft’s mobile software in the hands of our end users. By enabling flexible scheduling (we provide features such as shift-swapping, shift coverage and communications), our product makes a meaningful difference in people’s lives. A high point in my career was hearing that several of my direct reports used the word “autonomy” in their feedback of my leadership style during a performance review. To know that my team felt that I gave them autonomy, while simultaneously supporting them as a leader, was a proud moment. 2. What challenges have you faced as a woman in your industry? How have you addressed them? Being a woman in tech, it is not uncommon to be the only female in the room. For me, part of overcoming that challenge lies in mentoring other women through the process. It helps me see all angles of the problem. I also have looked for others to mentor me and worked to integrate their suggestions on how I conduct myself in meetings, the type of language I use and how to stand up for myself when appropriate. I have practiced speaking up, even though it may feel uncomfortable, when I have something valuable to add to the conversation. It takes practice but I have made a conscious effort to do so. I have also incorporated suggestions on body language, such as planting both feet firmly on the floor, which I feel have contributed to my sense of confidence. I have directly challenged companies whose conference panels and participants are not representative of diversity, and I have praised conference organizers who do make an effort to have well-balanced gender diversity. Additionally, I am involved in networking groups such as mBolden and put myself forward to present at industry events. I have presented at Future Stores, Postback and the Mobile Growth Summit. 3. Tell us about a person who has inspired or mentored you. What key lesson did you learn from them? Heather Zorn at Amazon was a great mentor. She taught me the importance of establishing my own boundaries (no one is ever going to tell you to work less, she said) and set a great example of how to conduct myself as a female business leader. She was firm, intentional and generous with her time and taught me how to be a mentor myself. 4. What advice would you give to a woman getting started in her career? Look for mentors! Find other women who display attributes you admire and don’t be shy about reaching out. Those relationships can be invaluable. 5. What can women do to improve gender equity in the workplace? What can men do? Women can actively seek to hire and promote other women in their organization. Men can do this too. Supporting “top of funnel” organizations such as Tune House is another way I have worked to improve gender equity. 6. Tell us about a favorite book/show/podcast and why/how it inspires you. I enjoy Masters of Scale with Reid Hoffman, a founder of LinkedIn. He interviews entrepreneurs to understand how they grew their businesses, what pitfalls to avoid and how culture is a backbone of any successful company. He has shed light on issues such as best practices in hiring decisions and what to do when your business idea is failing and the company needs to pivot. He also examines leadership styles and addresses the characteristics of what makes a successful and inspiring leader. Lean In is of course a classic! 7. Where do you find support and inspiration? How important is networking and how do you expand your contacts? Networking is key. I make myself available for speaking opportunities and rarely say no to attending events that I feel are a good fit for my learning and development. My industry (like most) is relationship driven and maintaining those relationships through attending and participating in events has been fundamental. I also work on staying active on LinkedIn and am becoming more and more active on Twitter. I find inspiration when interviewing potential hires for the team — especially female candidates who are motivated and driven. 8. What are the most important characteristics of a good leader? What leadership traits are overrated? Servant leadership is something I aspire to. I am here to support my team and serve at their behest. My role is to clear roadblocks, empower them and help them grow — even if that means preparing them to move on to a new team. I always seek out opportunities to give them the chance to shine, such as taking the lead on presentations. 9. What would you do differently in your career if you had a do-over? I wish I would have challenged why I was often assigned the role of note-taker or scheduler and asked to share those types of responsibilities more equally among the team. I am careful of that practice among my own direct reports so that no one person becomes the group admin. 10. What would be the title of your autobiography? From Fortune 500 to Startup: One Woman’s Journey through the Trenches of the Corporate World, Only to Find Herself at Home in a Group of 25. We’d love to hear from more women across all industries who are challenging the status quo. Does it sound like you? If it does, click here and fill out our questionnaire. Feel inspired? Join us for our second Daring Women event in May 2019, date TBD. Daring Women Q&A responses have been edited and condensed.